Alexa (from Alexa Loves Books) is doing a guest BookBags today and I'm pretty excited for her theme which is: Fairytale Retellings! I asked Rachel if I could guest post for BookBags, because I had just come up with a theme I was super excited about: fairytale-inspired novels! I really love seeing how writers come up with creative ways to spin the stories I’ve known and loved since I was little. Here are three that I’ve enjoyed and some awesome bags to match! Hook’s Revenge is an extremely awesome tale inspired by Peter Pan, focusing specifically on Captain Hook’s daughter Jocelyn and her adventures. The minute I saw this tote on Modcloth, I just knew it’d be a great match for the cover! Plus, I do think that the name perfectly expresses how Jocelyn deals with all the challenges she faces. My fascination with Little Red Riding Hood led me to Sisters Red, which I thought was a pretty creative tale! I wanted to include that novel in this post, so I searched for a while until I came across this bag that matches the (epic) book cover perfectly. It’s the priciest of all my choices today, but it’s so dang cute! Thanks Alexa for doing the guest post! I like the Sisters Red pairing the best - but that's because I love red! OH I LOVEEE this KATE SPADE combo!!! you go, Alexa! 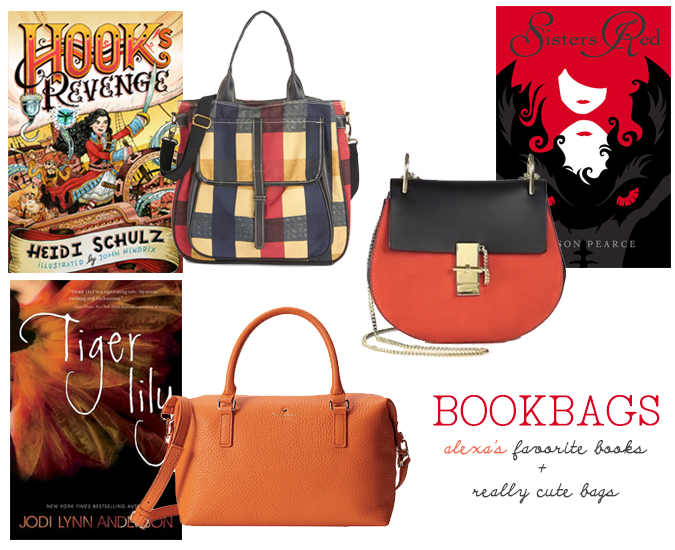 Honestly, I had so much fun putting together this BookBags post, R! I think I might have to "convince" you to let me do another post soon ;) Thanks for having me on the blog!